Exercise those little grey cells with "Brain Training, How Old is Your Brain?" The original brain trainer on the Nintendo DS! 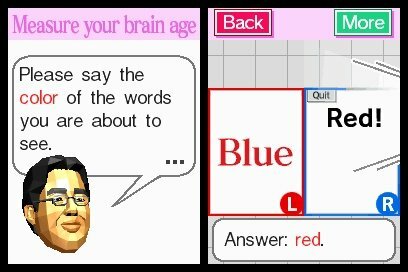 Dr Kawashima's Brain Training, How Old is Your Brain? Or simply "Brain Training" as it is commonly referred to, was the first major mental work-out game for the DS (the game is known as Brain Age: Train Your Brain in Minutes a Day!, in the US). This game was responsible for kick-starting the brain training craze that helped sell millions of DS consoles and make Dr Kawashima into something of a celebrity. More than two years later, the game can be purchased at knock down prices from most of the online retailers, but is it still as compelling as back then? When you first fire up the game card, you are welcomed by the digitized head of Dr Kawashima and presented with four options. "Quick Play", "Daily Training", "Sudoku" and "Download". Quick play serves mostly as an introduction to the game, and lets friends and family without their own profile dive straight into the game. Download lets you play a simple multiplayer game, but more on that later. The bulk of the game lies in the Sudoku and Daily Training modes, so lets delve into Daily Training first. After creating a new profile with a few simple settings, Dr K gives you a little introduction to the software and then you are invited to do your first brain age check. The first challenge we were presented with was "say the colour". This game prints multi-coloured words to the screen, for example it might print the word "red" but actually colour the word in blue. The challenge is to say the actual colour rather than the word. Trickier than it sounds! Sadly, this challenge is spoiled by the fact that the voice recognition is not too good. Sometimes, you can say "blue" until you’re blue in the face but the software never figures out what you are trying to say. Since the whole point is to get the answer as quickly as possible, it wasn't surprising when my brain age came in as that of an 80 year old, in spite of only making one or two mistakes. Blue!! Blue darn it! I said "BU-LOOOOOH!" Calculations (20 or 100) - Simple arithmetic where you write your answer on the touch screen. The handwriting recognition is pretty accurate here. Reading aloud - Just read the passage as quickly as you can. Though you can say whatever you like as the software doesn't actually check. Low to high - Memorise numbers in a grid then tap the blank squares from lowest to highest. Syllable count – count the syllables in each passage. Head Count – People will enter and exit a house, you then have to count only those left inside the house. Harder than it sounds, you will need to concentrate for this test! Triangle Math – calculate the adjacent numbers, from top to bottom, then add or subtract and place your answer in the box. Voice Calculation – answer the arithmetic questions out loud. Again, the voice recognition spoils this exercise somewhat. After each test you will be given a score and then an indication of your speed. Speeds range from walking speed for poor performances to rocket speeds for the wannabe geniuses.